To promote the shared network and accelerate products to market, industry is working toward a common technical platform including open source software, hardware reference designs, test plans and certification services to develop and verify the correct operation and implementation of TSN-enabled products. THE INDUSTRIAL INTERNET OF THINGS (IIoT) continues to grow. New capabilities and opportunity across industrial settings bring a need for streamlined operational and manufacturing models. As awareness surrounding IoT standardization continues to grow, more eyes are being drawn to the necessity of interoperability and network infrastructure solutions, including Time Sensitive Networking (TSN). TSN ensures the predictable delivery of time-critical traffic and can also integrate with existing applications and standard IT traffic to strengthen interoperability. TSN is a standard from the IEEE that solves the need to process raw data in a time critical fashion, reducing latency while providing robustness, and ultimately creating a foundation for more advanced manufacturing and product models where data can be shared more flexibly between layers of the control system. These increased IoT infrastructure and network capabilities require a need for an interoperable ecosystem that allows for multiple manufacturers, protocols, and organizations to share the same TSN network, increasing productivity and ensuring network success. To prepare for this, Avnu Alliance selects and certifies a set of underlying mechanisms to meet a given market′s requirements, creating a common infrastructure that others can build on top of to enable convergence between Operational Technology (OT) and Information Technology (IT). This convergence increases connectivity to industrial devices and enables a faster path to new business opportunities including big data analytics and smart connected systems and machines. The Avnu Alliance is an industry alliance that fosters and develops an ecosystem of manufacturers providing interoperable devices for industrial networked systems. Made up of key technology and equipment providers, the industrial segment within Avnu includes member companies across the entire ecosystem and supply chain including IT vendors, silicon providers and industrial suppliers all working together to create an interoperable ecosystem of low-latency, time-synchronized, highly reliable networked devices. Avnu creates certification programs to ensure interoperability of networked devices for multiple markets and applications from machine control, health-care, smart grid and robotics to power generation, process control as well as automotive for the future of autonomous driving. Standard Ethernet has evolved to enable next generation control systems. 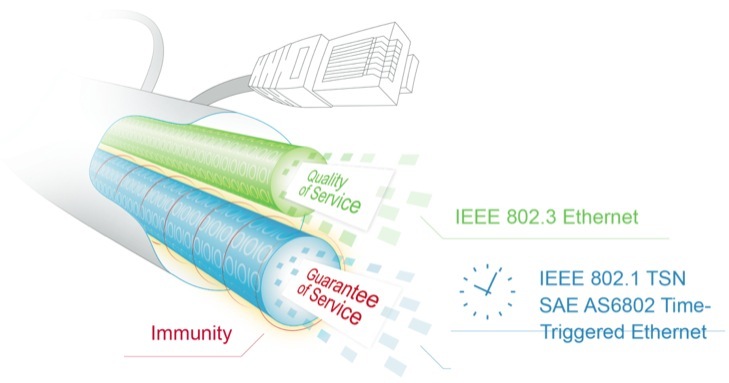 With this, recent work by IEEE 802, the Internet Engineering Task Force (IETF), and other standards groups has extended the ability to operate time- sensitive systems over standard Ethernet networks, supporting diverse applications and markets including professional audio/video, automotive, and industrial. TSN supports real-time control and synchronization, for example between motion applications and robots, over a single Ethernet network. TSN can at the same time support other common traffic found in manufacturing applications, driving convergence between IT and operational technologies. As Avnu has shown success in audio/video applications, it is helpful to be able to reuse this technology in modern machines using video cameras in control loops. As TSN supporting network infrastructure become more prevalent, many of today′s modified Ethernet networks can move to TSN based networks, using their OT-based application layers on standard 802.1 Ethernet. TSN′s value is derived from simplifying convergence and increased connectivity, unlocking the critical data needed to achieve the IIoT promise of improved operations driven by big data analytics. Designers can take advantage of the advancements in processing, communications, software, and system design originating from the consumer world with a standard that evolves while providing precise timing. 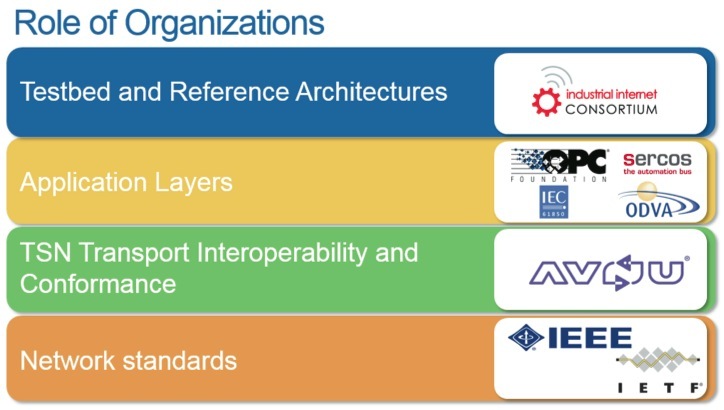 For industrial markets specifically, these standards support the ability to simplify development and deployment of distributed, synchronized, control systems commonly found in a variety of industrial applications including machine control, factory automation, power generation and distribution, oil and gas exploration, etc. Many of today′s generation of control applications are deployed using nonstandard network interfaces and infrastructure. Limitations to Ethernet have caused a fragmentation and lead to the creation of variants of Ethernet that include real-time performance to meet the needs of measurement and control applications. These variants often modify hardware and infrastructure components of the Ethernet stack to provide guarantees on behavior. These modifications provide the latency and bandwidth reservations needed for control. However, because they required modification of hardware they are no longer interoperable with standard Ethernet and they are much harder to access on the network, if at all. Additionally, in some cases the modifications prevent the systems from evolving along with Ethernet standards and they become limited in bandwidth compared to standard Ethernet. Unlike the proprietary modified variants of Ethernet, TSN and related efforts, including IETF projects such as DetNet, provide mechanisms to expand solutions to these applications using standard Ethernet technologies in a manner that enables convergence between OT and IT data on a common physical network. TSN ensures the predictable delivery of time-critical traffic and has the potential to integrate with existing applications as well as standard IT traffic to strengthen interoperability. Other advantages include simplified development and faster time to market. Avnu Alliance and liaison organizations are working together with the goal of creating a common foundation that allows multiple protocols and manufacturers to coexist on the same TSN network. To promote the shared network and accelerate products to market, Avnu Alliance facilitates a common technical platform through a number of services including open source software, hardware reference designs, test plans, and certification services to develop and verify the correct operation and implementation of TSN-enabled products. Avnu Alliance also coordinates with other organizations such as IEEE, IETF, ODVA, OPC Foundation and Industrial Internet Consortium (IIC) with the goal of creating this common foundation allowing multiple protocols and manufacturers to coexist on the same TSN network. In 2017 the majority of projects will finish and become formal parts of the TSN standard. Several TSN sub standards are also in development with three of them already published. Now we are seeing increased interest from nearly all vendors. The first TSN industrial products became available to select customers in 2016 including controllers from National Instruments with Intel TSN silicon and drivers as well as TSN switches from Cisco and TTTech. This year we will see more products from multiple Avnu members. The fact that this is based on the open Ethernet standards means that technology adoption benefits from the investment of all the companies and brands supporting it and is not limited by a single company′s business plan or future decisions on how they are going to develop and support the technology. Manufacturers within the industrial market benefit from Avnu′s collective multi-industry experience and networking expertise to expedite advanced networking implementations ultimately leading to a faster path to market. As an example, Avnu has recently completed a best practices document entitled "Theory of Operation for TSN-enabled Industrial Systems," describing the system architecture and requirements for an industrial model that enables multiple industry group, vendors and protocols to share a TSN network. This document introduces the fundamental mechanisms needed for a system architecture to build on, including time synchronization, quality of service using scheduled transmission and network configuration and walks through the requirements for several industrial use cases including how to enable and integrate non-TSN technologies where needed. As the standards and networks continue to evolve so does Avnu′s work to define and certify the standard foundation. This eventually will include mechanisms such as frame preemption, redundancy, ingress policing, and security. In addition, Avnu′s defined foundation will continue to support additional capabilities, including support for multiple IEEE 1588 profiles, guidelines for scaling to very large network architectures, and aggregation/ composition of multiple networks into a single TSN-enabled network domain. Avnu certification will also continue to evolve with the standards and with interoperability as a baseline promise, backwards and forwards compatibility is assured. This means that system designers and engineers won′t architect a network that is outdated before it is even installed. As the need for time-synchronized communications continues to grow, Avnu Alliance will work to ensure that more companies are able to successfully use TSN in industrial settings and beyond. Technology report by Avnu Alliance.